335-0024 - 7" Pro Mini PVA Sponge Mop - Suggested Retail Price: $24.95 each - Special Quantity Discount Pricing is Available: 2 - 3 mops: $20.95 each, 4 - 6 mops $18.95 each, 7 or more mops $16.95 each. IMPORTANT: This is not our standard size (11" - see below) - it's very small. Are you ordering the correct size? 335-0020 - 11" Pro Standard PVA Sponge Mop - Suggested Retail Price: $27.95 each - Special Quantity Discount Pricing is Available: 2 - 3 mops: $23.95 each, 4 - 6 mops $21.95 each, 7 or more mops $19.95 each. 335-0022 - 16" Pro Jumbo PVA Sponge Mop - Suggested Retail Price: $32.95 each- Special Quantity Discount Pricing is Available: 2 - 3 mops: $28.95 each, 4 - 6 mops $26.95 each, 7 or more mops $24.95 each. NOTE: The 11" mop will not fit a standard round bucket (rectangular buckets are OK). 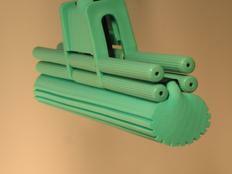 The 16" mop is oversized and requires a larger bucket like our Super Bucket. Or, wring out mop in a washtub or a sink. For use with all Super PVA mops. High impact polypropylene plastic for durability with large carry handle; holds 6.0 gallons (20 liters); inside of bucket marked with graduated gallon and liter index. Inside dimensions of bucket: 22" x 19" x 10" (h). Reinforced upper lip and rugged handle make this heavy duty bucket quite durable and long-lasting. Bucket includes roller casters. 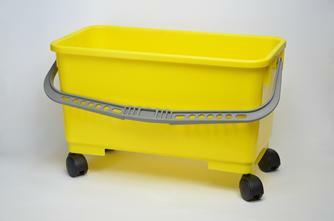 987-0016 - The Super Bucket - 6.0 gallon yellow bucket with casters and durable plastic handle. Casters may be removed easily if you prefer a bucket without casters. NOTE: This bucket replaces The Super 5.2 gallon bucket which has been temporarily discontinued. Regular Price: $49.95 each - Now Only $44.95 each.